Interesting discussion today at HuffPost Live about how the same data-driven analytics that revolutionized talent evaluation in pro sports are now being applied to the broader marketplace. Will the evolution away from traditional sourcing techniques, resumes, assessments, and other traditional hiring practices and toward new technology help or hurt? 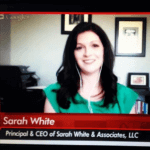 The consensus — as well stated by my friend, Sarah White — was that the new techniques will help employers and candidates alike as the new technology will help the two connect even if they’re not aware of each other.In addition, the new technology is enabling employers to move away from flawed personnel selection tools such as Myers-Briggs and other personality tools.